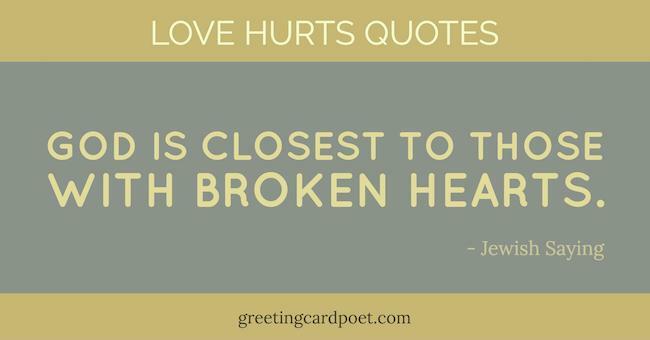 Our collection of love hurts quotes provides some perspective on the challenges of relationships. The pain that love can deliver can be the most difficult thing to bear. It is this pain that has inspired some of the greatest works of literature and driven the hearts of men and women to share their pain. The moment you start loving someone, you also put your heart at risk of getting hurt. There are no guarantees in love, and you can never be sure where it will lead. They say when a broken heart cries, the heavens cry with it. Nothing can soothe a heart that is hurt by love. When you are hurt, there is an unsung contentment in reading to the words of other broken hearts. Here are some love hurts quotes to reflect on. Why is it that we don’t always recognize the moment love begins, but we always recognize the moment it ends? Memories are coming back. Pain! I tried so hard to erase it. The time I am spending without you, from you makes me remember you even more. If love is so important to have that one doesn’t want to lose it, why is it when we find true love we often don’t notice it? Check out Inspirational Love Quotes. One of the hardest lessons in life is letting go. Whether it’s guilt, anger, love, loss or betrayal. Change is never easy. We fight to hold on, and we fight to let go. If you have it (love), you don’t need to have anything else, and if you don’t have it, it doesn’t matter much what else you have. My silent heart, lie still and break. I’ve been hurt but I’ll continue to love, for that gives me courage to go on with my life. Love is blind and love can be foolish – our heart doesn’t always love the right people at the right time. Sometimes we hurt the ones that love us the most, and sometimes we love the ones that don’t deserve our love at all. When you are in love and you get hurt, it’s like a cut, it will heal, but there will always be a scar. Without love our life is … a ship without a rudder … like a body without a soul. I self-destruct every relationship so that I don’t get hurt but in truth I just hurt myself worse in the long run. At what point of time do you realize something you have been working for so long and so hard is no longer worth fighting for? After the fight I realized it. Tip: Love Hurts quotes might help someone who is going through a difficult time in a relationship. Knowing what to say and when to say it is an art. At first, it might help just to listen. Every night, I laid awake with your memories flooding through my eyes with the hope to be with you when sleep arrived. I loved you then I love you now, I love you still, always have always will. With relief seeking lost love. Sometimes waiting is the hardest thing of all. You did love me, I whispered. Just not the same way I loved you. I fight for what I want and that’s you. But sometimes I ask to myself if you’re worth it, my heart says yes you are. But I don’t want to fight a war if I’m going to lose. May be its a good idea to write something about you in my book… At least then, there will be a place where we will meet everyday… and be together forever! Willingness to possess is the beginning of..love hurts. Don’t fall in love. Fall off a bridge, it hurts less. The worst way to miss someone is to have them sitting right next to you… And knowing you have absolutely no chance with them. He was changed, burned, branded, destroyed and rebuilt. And he loved it. Our love was like a game to you… when you got bored, you quit. If you have recommendations, please let us know via the Contact page. Thanks. You’re on Love Hurts Quotes page.